Watching the snorty wildness of a sagebrush bronc ride. Smelling the caustic aroma of a midday roll-yer-own swirling on the breeze. Pulling a baby calf with your bare hands and praying it draws breath. These sensations are ordinarily the private domain of working cowboys, but country folks and urbanites alike will soon be able to experience the complex nuances of the big outfit lifestyle via the big screen. Cowboys: A Documentary Portrait chronicles life on a modern-day big outfit, as portrayed and narrated by the cowboys themselves. 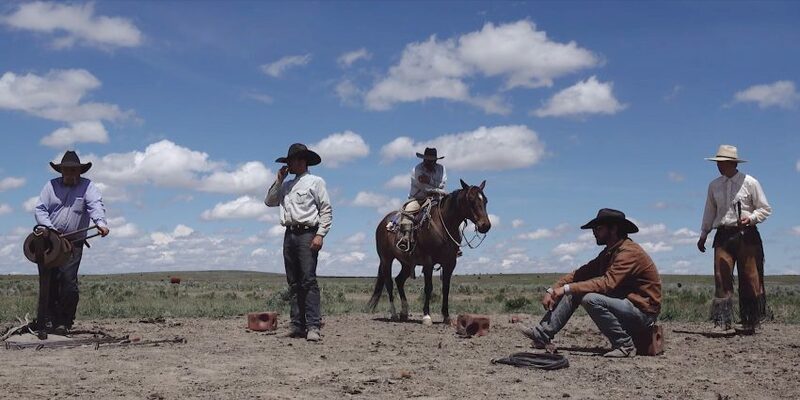 Filmmaker Bud Force and acclaimed photographer John Langmore recently teamed up with Creative Producer Felicitas Funke to tell the story of the cowboys and their families who make a living – and a life – in the saddle and on the range. “The audience is going to ride side by side with the cowboys and learn not only their day-to-day workings, but also their personal stories and challenges unique only to this lifestyle,” says Force. Langmore took this still image of a buckaroo riding a bronc on the open desert. In order to accurately depict life on a modern-day big outfit, the directors chose to film only on ranches that run full crews in eight Western states. They spent two years filming on nine ranches in Texas, New Mexico, Arizona, Nevada, Idaho, Wyoming, and Montana. Cowboys includes ranch work from all four seasons, from breaking ice to pulling calves and weaning in the fall. The film’s overall impact far exceeds practical education, though. “I would consider it a biopic about this singular character being the ‘cowboy,’ but as told by multiple people who are each in essence that same character,” says Force. This color shot of a group of cowboys around the branding pot is a still image directly from the film. The documentary Cowboys deconstructs the romantic notions of the cowboy lifestyle typically portrayed by Hollywood movies and paperback novels. Throughout the film, working cowboys explain ranch work and their dedication to the lifestyle in their own words. They wear drastically different hat shapes, but they all share a common quality: They answered the call to be a cowboy and never looked back. “Cowboying isn’t what you do. It’s who you are,” said one weathered cowboy featured in the movie. Like all others interviewed during the movie, the speaker was not directly identified. Stories and explanations are carefully paired with corresponding scenes throughout the movie to guide the viewer through all aspects of ranch life, but the overall message resonates with a unifying theme that transcends ranch life. “People are people, and some of those people are cowboys. Whether you live in the mountains, on the prairie, or in the desert, there’s still that tie – no matter where you are,” says Force. For a deeper look inside the ranching lifestyle, Cowboys includes a woman’s perspective. The camera crew visited me and my family at our remote cow camp home in Arizona, where I shared my experiences of living 4 hours from town. Our monthly grocery shopping was a 3-day trip, and I daily crossed my fingers that my kids wouldn’t break an arm. Footage of me taking clothes off the line and my children twirling on a tire swing are featured alongside the cowboy crew branding calves and wrangling the cavvy in the evening light. “Outside of interviews, we did not stage a single scene in this movie,” says Force. Aerial footage shot with multiple drones adds breathtaking views such as this one to the finished movie. This staunch adherence to the truth results in a movie that is gritty, raw, and wholly authentic. It captures a snake-bit horse, rows of cattle carcasses bloated and blackened by wildfire, and a family’s grief over their young son’s death from a ranching accident. For those willing to assume the risks, the big outfit lifestyle also provides plenty of unexpected levity alongside the darkness. Cowboys includes a montage of bronc rides, punctuated with photographs of a cowboy mid-air and a trio of horseback gents with their heads thrown back in laughter. Langmore’s black-and-white still images are regularly interspersed throughout the movie, inviting the viewer to quietly deliberate the livestock, gear, and rugged scenery along with the interview subjects. “We wanted to convey how deeply these men and women reflect on their lifestyle,” says Langmore. 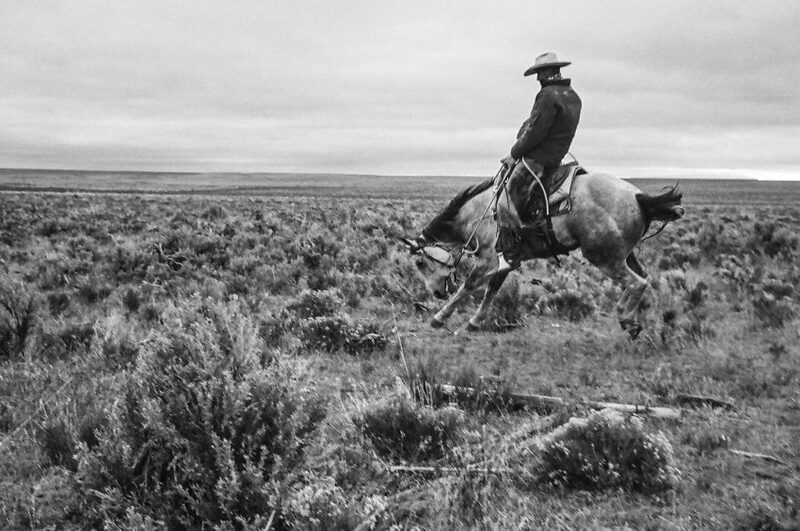 The landscape of ranch country greatly shapes the lifestyle and character of the working cowboy. 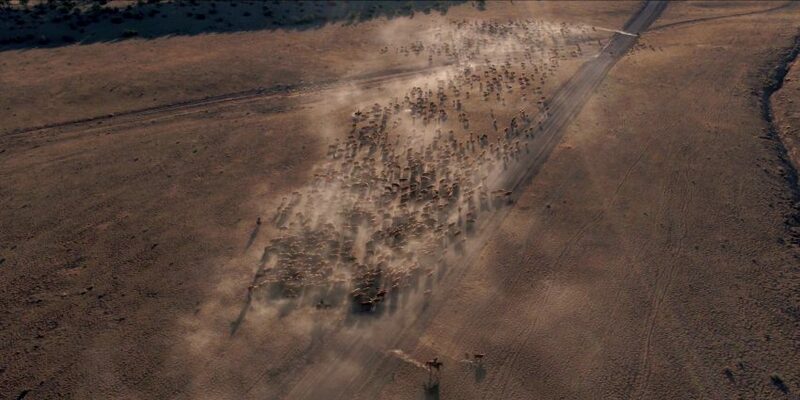 Cowboys includes breathtaking aerial footage of big herds of cattle and cowboys running through the dust of the American desert. Despite cell phones, WiFi and indoor plumbing, men and women still earn a living by taking care of cattle with a horse and saddle every day. Cowboys is scheduled to premiere this spring, then be available in select theaters before being released on DVD/Blu-ray and streaming online later in the year. For more information and to watch the trailer, visit www.thecowboymovie.com.